How Are Social Networks Useful for IUU Fishing? Chasing the Fish Oil—Do Bunker Vessels Hold the Key to Fisheries Crime Networks? Illegal, Unreported and Unregulated (IUU) fishing is recognized as a major threat to the health of the world's oceans. In addition, the discourse around IUU is recognizing and recommending that IUU be viewed through the lens of transnational crime. Reducing IUU fishing therefore requires a detailed understanding of how fishing fleets function and interact transnationally. However, this is difficult to determine because IUU fishing is by nature a clandestine activity, and often occurs in contexts that, by intention, make monitoring very difficult. Disentangling fleet activities therefore necessitates identifying and understanding how key players or actors function to support or guide IUU activities. In this regard, recent efforts have focused on identifying transshipment activities by finding and following refrigerated cargo (reefer) vessels. We suggest that bunker, or fuel vessels, may provide one solution to understanding and unraveling these IUU networks for two main reasons: they are fewer in number, are known to provide additional support to fishing vessels beyond refueling. In this respect, bunker vessels are also used to resupply provisions, and crew, thereby facilitating human trafficking and slavery, which is demonstrably rife in certain components of the commercial fishing realm (e.g., long distance or high seas fleets). Here, we illustrate how social network analysis (SNA) could be used as a methodological lens to expose previously clandestine IUU fishing fleet dynamics. Specifically, we highlight the connectedness of a tanker vessel, and several fishing and reefer vessels, in an area in the Southern Indian Ocean that has high levels of fishing and general shipping. Globally, seafood is one of the most traded food commodities and the primary source of animal protein for more than 40% of the world's population (FAO, 2016; Kittinger et al., 2017). Illegal, unreported and unregulated (IUU) fishing is a major threat to the sustainability of national and international fisheries around the world. However, it not only threatens fisheries management (Heylar et al., 2014), but leaves communities at risk of overfishing, leading to the shortage or extinction of species which they rely on for economic and food security. Illegal unreported and unregulated fishing, cited as one of the three main causes for poor performance of fisheries management, is estimated to account for 11–19% of catches globally, and costs legal fisheries up to US$23 billion annually (Agnew et al., 2009; FAO, 2015). Illegal unreported and unregulated fishing has been associated with having a wide variety of impacts ranging from the socio-economic stability of fishing communities (Arias and Pressey, 2016), to habitat damage (MRAG Marine Resources Assessment Group Ltd, 2005), bycatch of declining species such as albatross (Michael et al., 2017), and overharvesting and potential crashes of high value stocks such as Southern Bluefin Tuna (Polacheck, 2012) and Sturgeon (Yimin and Valbo-Jorgensen, 2012). Beyond such direct fisheries related impacts, IUU has also been associated with a wide variety of other criminal activities, including human trafficking and forced labor, and smuggling of weapons and drugs (United Nations Office on Drugs and Crime, 2011; Pramod et al., 2014). Addressing any illegal activity is challenging, as they are typically conducted in secret, and by their design take advantage of shortfalls in the capacity of regulatory agencies to control them. In the context of illegal fishing, these shortfalls include the challenge of monitoring vessels at sea (Dunn et al., 2018), but also wider issues involving the lack of transparency in vessel ownership (Griggs and Lugten, 2007), continuation of access to insurance (Miller et al., 2016), scarce information on the history and past infractions of operators, limited information sharing among enforcement agencies, and challenges due to the sheer number and complexity of operations (Le Gallic and Cox, 2006; Lindley and Techera, 2017). However, some of these issues may be addressed through investigating the apparent coordination among vessels, as observed in their movements and interactions. For instance, if vessels regularly rendezvous, one might infer that they are cooperating, and potentially even have a common owner. 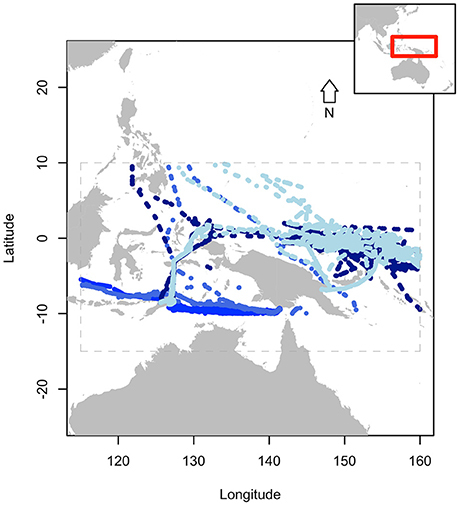 Vessel position data is available at the global scale for all vessels mandated by International Transport Workers' Federation (ITF) to carry Automatic Identification System (AIS) receivers (International Maritime Organisation, 1974), and includes a significant proportion of the vessels that could potentially be involved in IUU fishing (Mazzarella et al., 2014; Natale et al., 2015). We propose using associations among vessels to overcome a number of the challenges faced by regulatory agencies in addressing IUU fishing. 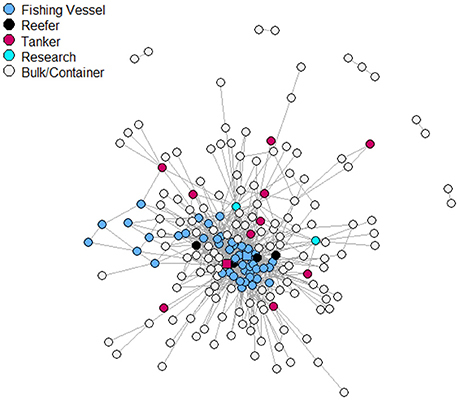 In particular, associations among vessels can be used to elucidate social networks such as shared ownership or cooperation, aggregate infraction information and vessel histories to identify groups of vessels at high risk of IUU activity, and infer risk for vessels where historical information is unavailable. A considerable amount of literature in criminology and social psychology illustrates the important role that socialization and the surrounding environment play in shaping people's behaviors. While an extensive literature review is beyond the scope of this current project, a key finding from these research domains is that people's behaviors are shaped by their social and natural environment and the people with whom they associate (e.g., Bandura and Walters, 1977; Gordon et al., 2004; Akers, 2009). Understanding the dynamics and mechanisms of information transfer in the social systems or networks that these criminals operate in is therefore vital and can be accomplished with social network analysis (SNA). Broadly, SNA aims to describe and explain the structural patterns and mechanisms that define social relationships between humans (Scott, 2017). In brief, SNA shows how individuals are joined in a population using various metrics. These range from degree centrality, which counts the connectedness of a node given the number of connections, to more complex metrics such as eigenvector centrality, in which a node's importance is proportional to the centrality score of all its connections (for more information see Mbaru and Barnes, 2017). Social network analysis has previously been used to understand natural resource governance (e.g., Bodin and Crona, 2009), including fisheries-related topics such as the success of co-management arrangements (Sandström et al., 2014; Alexander et al., 2015), willingness of fishers to enforce sea tenure (Stevens et al., 2015), information diffusion among resource users (Pietri et al., 2009; Mbaru and Barnes, 2017), and recently, to tie fishing practices to ecosystem health (Barnes et al., 2016). Illegal unreported and unregulated fishing is recognized as a multi-dimensional transnational crime problem (Liddick, 2014). Identifying IUU fishing activities is problematic given their clandestine nature, the range of different behaviors that fall under the umbrella of IUU fishing (e.g., transshipment, underreporting catches, etc. ), and the many contexts in which IUU fishing occurs (e.g., on the high-seas, or offloading in busy or unregulated ports). The United Nations Food and Agriculture Organization Port State Measures Agreement (PSMA) is an international agreement that attempts to standardize port inspections across all coastal countries globally (FAO, 2009). The agreement is designed to close off the opportunities for IUU fishing vessels to land catches and obtain supplies, and has identified fishing related activities. These include activities by non-fishing vessels that provide vital support to fishing vessels engaged in IUU fishing, notably refrigerated cargo and refueling, or resupply (Doulman and Swan, 2012). Under these provisions outlined by the PSMA, refrigerated cargo vessels and refueling, or bunker, vessels fall within these categories. These vessels provide keystone functions that facilitate the continuation of IUU fishing - they allow vessels to unload catch, restock provisions and refuel, and thus be at sea for extended periods of time, avoiding oversight and control. Transhipment is defined by the FAO as the exchange of fish from a fishing vessel to another vessel being used solely for transporting cargo (Food and Agriculture Organization Fishing Technology Service, 1996). Transhipment has become an important component of fisheries supply chains (Satria et al., 2018) and is associated not just with movement of catch, but also with refuel and resupply of provisions, and has been linked to other crimes, such as drug and weapons trafficking (United Nations Office on Drugs and Crime, 2011; Ewell et al., 2017). Fuel resupply vessels (bunkers) have been acknowledged as an integral component of the infrastructure needed to maintain IUU fishing (Gianni and Simpson, 2005). However, we propose that the importance of bunker vessels has been underplayed to date, and increased effort should be focused on tracking and monitoring them. In comparison to reefer (refrigerated cargo) vessels, bunker vessels (although fewer in number) are likely more connected than reefer vessels. We propose that tracking their paths and movements should indicate zones of both legal and potential illegal fishing activity. Here, we apply SNA to illustrate the dynamics, network position, and importance of bunker vessels in a fleet. Social network analysis is a valuable but seemingly unused tool for this type of investigation; it can provide a framework to infer associations and describe a social structure (Farine and Whitehead, 2015), in some cases allowing inference about vessels based on their associates and connections. We demonstrate how it can be applied to fishery fleet dynamics to understand the nature of the connections and the key players in a network. We examined social networks of vessels in a region of the southern Indian Ocean (bounded by Latitude S 25°-S 35° and Longitude E 80°-E 110°) characterized by extensive fishing activity and major shipping lanes transiting to and from Australia. We used 6 months of AIS data, from May to October 2016, in order to demonstrate our application of the methods discussed here. Automatic Identification System was originally developed and implemented for safety as an anti-collision tool and is mandated for all vessels 300GT and over, on international voyages, and all commercial passenger ships (International Maritime Organisation, 1974). There were 181 unique vessels with more than 100 registered AIS transmissions in the region, which included: 119 bulk/container/vehicle carriers, 45 fishing vessels, 11 oil/chemical/liquefied petroleum gas tankers, 4 reefers, and 2 research vessels. We used iGraph package (Csardi and Nepusz, 2006) in R (R Core Team, 2016) to model an undirected and unweighted network. We considered each of the 181 unique vessel Maritime Mobile Service Identity to be a vertex, and edges were calculated assuming proximity (within 10 km) to other vessels on a given day. An important point to note here is that we were using movement to infer a social network, so proximity, or potential rendezvous, were assumed to represent interactions, which we were then able to map. In this sense, we were constructing a social network from surveillance data, not from interaction with the actors. There are potential benefits to such an approach, in that it may avoid respondent bias, but also some limitations as it is an indirect measure of the social network. We note that we have used a proximity measure here, and any changes in the assumed connection of nodes will cause variation in results. In addition, due to the purpose and focus of this article, we keep all reference to particular vessels or flag states anonymous. The SNA of vessels in the southern Indian Ocean (Figure 1) indicates several key players, and results point to several potential sub-networks. Importantly, across several measures (each of degree centrality, closeness, and eigenvector centrality), a tanker (bunker) vessel was ranked highest for each measure, followed by two fishing vessels (registered longliners). Most importantly in this context is the measure of eigenvector centrality, which is a combined measure of a vessel's importance, and the importance of all its connections in the network. For this measure, the top three ranked vessels were a tanker and two fishing vessels (both longliners). Given all 181 vessels, fishing vessels placed 35 out of the top 40 vessels. The other five vessels in the top 40 were the tanker (1st) and four reefer vessels. Figure 1. Network plot of all 181 vessels in the region. Most central node is indicated by a red square, and most central fishing vessel by a blue square. This network pattern is likely as bulk and container vessels are most often traveling in shipping lanes, so will be occasionally close to other vessels, but not always. Whereas fishing vessels, on a fishing ground, will by nature have some association as they share an underlying area where they are operating and thus will be jointly driving the centrality. There appear to be potential indications toward potential subnetworks, in which certain fishing vessels are serviced by specific reefer vessels. However, the tankers appear to be less selective and more connected across the network in comparison to reefer vessels, highlighted by higher connection scores. Given our findings that tanker vessels are central in a network of fishing vessels, we propose that they may serve as a useful indicator of fishing vessel activity. This is particularly relevant as fishing vessels are not required to transmit AIS (International Maritime Organisation, 1974), and often when operating outside the control of a Regional Fisheries Management Organisation or national government, they may not carry a vessel monitoring system, and so are effectively unmonitored. While surveillance data, such as satellite radar, may still identify them, this data is limited in availability and generally quite expensive. By contrast, bunkering and refrigerated cargo vessels are required to transmit AIS, and thus are more readily tracked (Metcalfe et al., 2018). However, it is important to note that there is the possibility for all vessels to switch off their AIS (Tetreault, 2005) and thus go unmonitored. We show tracks of several support vessels (Figure 2), including bunkering and refrigerated cargo vessels, traversing the region between Papua New Guinea, Indonesia, Timor Leste, and Australia. Of note are the positions of these vessels off of the south coast of Timor Leste. These support vessels remained in this region for extended periods of time, despite the lack of any relevant infrastructure, and returned on numerous occasions. Sometime well after the authors initially noted this behavior, subsequent reports emerged that several large factory trawlers from China were operating in Timor Leste waters (IUUWatch, 2017). Although we are not aware of any actual link, we propose that this example is a key illustration for linking illegal networks with observed activities in an area—the irregular behavior of the bunker vessels was evident well before any knowledge of illegal fishing activity in the area. Figure 2. Tracks of four supply vessels noted to have had irregular behaviors. Gray dashed lines indicate extent of data for purposes of presentation. Inset box displays extent of data in larger region. Social networks have been used to study ecological interactions for varying populations. The application of SNA above demonstrates the applicability of the use of social networks in understanding and assisting in maritime domain awareness, and specifically as it is applied to fisheries monitoring. A key advantage of such an approach is that the network highlights the key conduits of information. In the example we provided, a bunker vessel and several fishing vessels were frequently ranked at the top, regardless of which measure of centrality was used. This effectively highlights the importance of tracking supply vessels to uncover potential IUU activities. As previously noted, most of the focus to date has been on the role of reefer vessels in facilitating IUU activity (predominantly through transshipment). However, we propose that bunker vessels, which classify as support vessels and thus fall within the definition of IUU, are an important conduit within the IUU network. The role of bunkers as a key conduit of information positions them to potentially hold information about illegal networks. It is also possible that bunker vessels, in their role of transshipment of provisions and crew, thereby facilitate human trafficking (Ewell et al., 2017). As such, resupply vessels are either knowingly, or inadvertently, supporting conditions conducive to slavery. Previous research has highlighted the role that insurance companies could play in combatting IUU fishing (i.e., withholding insurance for vessels known to engage in IUU, see Miller et al., 2016 and Soyer et al., 2017), an approach that may also be conducive to curtailing the role of supply vessels deemed to support IUU fishing activities. Raw S-AIS data can be obtained commercially from provider Exact Earth through their website (http://www.exactearth.com/products/exactais). JF and CW conceived the idea, JF did the analysis, JF, CW and BB contributed to the writing. The authors would like to thank the Paul Allen Foundation and CSIRO Ocean's and Atmosphere for supporting this project and to the Australian Marine Safety Authority for supplying the AIS data. The reviewer TM declared a shared affiliation, with no collaboration, with the authors to the handling editor at the time of the review. Akers, R. (2009). Social Learning and Social Structure. New York, NY: Routledge. Bandura, A., and Walters, R. H. (1977). Social Learning Theory Vol. 1. Englewood Cliffs, NJ: Prentice-hall. Doulman, D. J., and Swan, J. (2012). A Guide to the Background and Implementation of the 2009 FAO Agreement on Port State Measures to Prevent, Deter and Eliminate Illegal, Unreported and Unregulated Fishing. FAO Fisheries and Aquaculture Circular, No. 1074. FAO (2009). The State of World Fisheries and Aquaculture Food and Agriculture Organization. Rome: United Nations. FAO (2015). Report of the Expert Workshop to Estimate the Magnitude of Illegal, Unreported and Unregulated Fishing Globally. Rome. FAO (2016). The State of the World Fisheries and Aquaculature. Food and Agriculture Organization, Rome: United Nations. Food and Agriculture Organization Fishing Technology Service (1996). Fishing Operations. FAO Technical Guidelines For Responsible Fisheries. Rome: FAO. Gianni, M., and Simpson, W. (2005). The Changing Nature of High Seas Fishing. How flags of Convenience Provide Cover for Illegal, Unreported and Unregulated Fishing. Australian Government Department of Agriculture, Fisheries and Forestry. International Maritime Organisation, IMO. (1974). International Convention for the Safety of Life At Sea. 1 November, 1184 UNTS 3. IUUWatch (2017). Available online at: http://www.iuuwatch.eu/2017/09/east-timor-makes-illegal-shark-fishing-bust/ (Accessed May 10, 2018). Mazzarella, F., Vespe, M., Damalas, D., and Osio, G. (2014). “Discovering vessel activities at sea using AIS data: Mapping of fishing footprings,” in 17th International Conference on Information Fusion (FUSION) (Salamanca). MRAG Marine Resources Assessment Group Ltd, (2005). IUU Fishing on the High Seas: Impacts on Ecosystems and Future Science Needs. London: MRAG. Tetreault, B. J. (2005). “Use of the Automatic Identification System (AIS) for maritime domain awareness (MDA),” in Proceedings of Oceans, MTS/IEEE (Washington, DC), 1590–1594. United Nations Office on Drugs and Crime (2011). Transnational Organized Crime in the Fishing Industry. Vienna. Copyright © 2018 Ford, Bergseth and Wilcox. This is an open-access article distributed under the terms of the Creative Commons Attribution License (CC BY). The use, distribution or reproduction in other forums is permitted, provided the original author(s) and the copyright owner(s) are credited and that the original publication in this journal is cited, in accordance with accepted academic practice. No use, distribution or reproduction is permitted which does not comply with these terms.